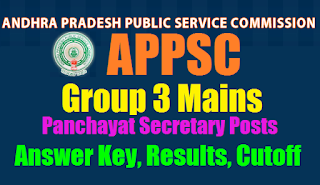 APPSC Group 3 Mains Re APPSC Group 3 Mains Results Panchayat Secretary (Grade IV) Cutoff Marks sults Cutoff Marks – APPSC Panchayat Secretary District wise marks List download @psc.ap.gov.in Response Sheets for Panchayat Secretary (Grade IV) APPSC Group 3 Mains Panchayat Secretary Main (CBT) Examination held on 06/08/2017F.N.& A.N.,and on 07/08/2017 FN& A.N. at 13 districts of A.P. and Hyd, for the post of Panchayat Secretary (Gr-IV) vide Notification No. 29/2016. The Marks List of the candidates with the following Register Numbers district wise. are available here. Andhra Pradesh Public Service Commission (APPSC) successfully conducted Group 3 Mains examination for the recruitment of Panchayat Secretary posts on 6th August 2017. A huge number of candidates who had qualified in the prelims exam appeared for the APPSC Group 3 Mains exam across various examination centers in Andhra Pradesh. Candidates who had written the exam are searching for the APPSC Group 3 Mains answer key 2017 so that they can analyse the performance in the exam and predict the results. APPSC not yet released Group 3 Mains answer key. Meanwhile, candidates can check APPSC Group 3 unofficial answer key from the direct link provided below. We will update APPSC Group 3 Mains 7th August answer key here. APPSC Panchayat Secretary Mains Exam Results 2017.